Frisco Tap House started out in 1996 as Frisco Burrito in Towson, MD. It soon expanded to include a location in Columbia, MD offering southwest food and featuring burritos and more specifically a vegetarian burrito. As the small burrito shop in Columbia grew, it took over more space and added a bar offering 20 taps of craft beers, a top shelf collection of Tequilas and a mix of wine and liquor. Frisco (as it became known) quickly became a regular neighborhood hangout place and a “top secret” beer bar. Looking for a way to increase business and reward the “regulars”, the Mug Club was born. Wanting more ways to increase business and have fun with guests, Wednesday nights became a special weekly event known as Pint Night. As the regular crowd got larger they created a super fun and friendly atmosphere and where several lifelong friendships developed. Frisco continued to increase its popularity and on most weekend nights was overflowing with “friends” wanting to kick back, relax and have some fun. 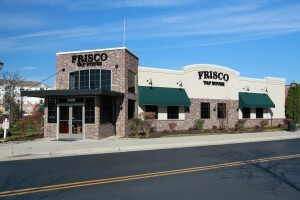 In December 2010 Frisco became Frisco Tap House and moved to its current Columbia, MD location featuring over 50 rotating craft beers. It experienced immediate success and the “Frisco Family” got bigger and bigger. A little over a year later Frisco Tap House introduced PUSH American Brewing Company, its own in house craft beer label with brewing on location. In 2014, owner and operator, Adam Carton decided it was time to expand some more. So he joined forces with Christopher Swann and the new Gambrills location was born. 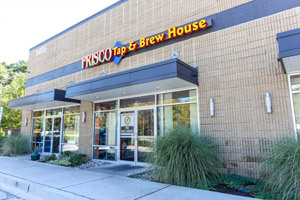 Frisco Tap House II features over 100 rotating craft beers and a dynamite space for enjoying good times with friends. So what are you waiting for? Come out and join us at original Frisco Tap House in Columbia or our newest addition in Gambrills. We cannot wait to share the awesome Frisco experience with you!